Receiving critical acclaim as a stand-up, actor and author, Black has performed for audiences throughout Europe, New Zealand, Canada and the United States. In 2012, he performed eight sell-out shows at Richard Rodgers Theatre on Broadway. Born in Washington D.C. on Aug. 30, 1948, Black was raised in Silver Spring, Md. Colicky as a baby, he was destined to be angry and easily irritated. His mother, a teacher, and his father, a mechanical engineer, instilled the importance of education and the necessity to question authority—lessons that influenced Black throughout his life. He fell in love with the theatre at age 12, after seeing his first play, which led to pursuing a career in drama. Degrees followed from the University of North Carolina and Yale Drama School, with a stint in Colorado owning a theatre with a group of friends in the interim. During his tenure at UNC, Black ventured into stand-up, performing at Cat’s Cradle in Chapel Hill. Stand-up was a steady presence as he pursued his career in theatre. Black eventually settled in New York City and became the playwright-in-residence at the West Bank Café’s Downstairs Theatre Bar. He oversaw the development of more than 1,000 plays, including works by “West Wing” creator Aaron Sorkin, “American Beauty” writer Alan Ball, as well as his own original works. In addition to overseeing the works on stage, Black emceed every show. As the West Bank grew, so did Black’s stand-up skills. He left the West Bank in the late 1980s to pursue stand-up full time. In 1996, his friend Lizz Winstead tapped him to create a weekly segment for Comedy Central’s “The Daily Show.” The segment, a three-minute rant about whatever was bothering him at the moment, evolved into Back in Black, becoming one of the most popular and longest-running segments on the show for both the Jon Stewart era, and now The Daily Show with Trevor Noah. 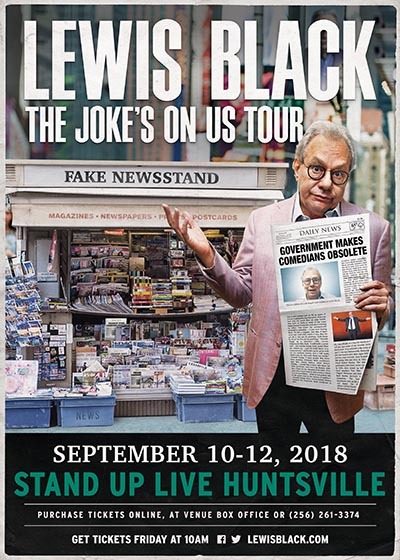 Black has also taped four specials for the “Comedy Central Presents” series, co-created “Last Laugh with Lewis Black” and presided over “Lewis Black’s The Root of All Evil.” His popular appearances on Comedy Central helped to win him Best Male Stand-Up at the American Comedy Awards in 2001. Increased exposure from “The Daily Show” generated a record deal with Stand Up! Records. His first CD, “The White Album,” was released in 2000 to critical acclaim. Black followed with eight more—six under the Comedy Central Records label. He has received five Grammy® nominations and two wins for his work. The first nomination came in 2006 for “Luther Burbank Performing Arts Center Blues,” the second in 2009 for “Anticipation.” In 2007 he won the Grammy for Best Comedy Album for “The Carnegie Hall Performance,” and again in 2011 for “Stark Raving Black.” His 2012 release, “In God We Rust” (Comedy Central Records) was also nominated for a Grammy. In 2015, Black joined the cast of Madoff (ABC mini series). Black portrays Ezra Merkin, who, after investing with Madoff and receiving great returns, brought many famous and well-to-do Jewish clients, including Elie Weisel and The Hadassah Organization, to Bernie’s fold. Black has appeared on “Larry King Live,” “Piers Morgan Tonight,” “Late Night with Jimmy Fallon,” “The Late Show with David Letterman,” “Late Night with Conan O’ Brian” and “The Late Late Show with Craig Ferguson.” Black has also had numerous appearances on CNN and MSNBC and has occasionally done the weather with Al Roker. In the midst of a rigorous touring schedule, regular TV appearances and movie roles, Black has written three best-selling books: “Nothing’s Sacred” (Simon and Schuster, 2005), “Me of Little Faith” (Riverhead Books, 2008) and “I’m Dreaming of a Black Christmas” (Riverhead Books, 2010). All garnered critical praise as well commercial success and spent numerous weeks on the New York Times best sellers list. Black has penned more than 40 plays, many of which have been produced around the country. “The Deal,” a dark comedy about business, was made into a short film in 1998 and picked up by the Sundance Channel. In 2011, his play “One Slight Hitch” was produced at the Williamstown Theatre Festival and then again in 2012 at both the ACT Theatre in Seattle and The George Street Theatre in New Brunswick. In 2006, Black had a break-out year as an actor, co-starring with Robin Williams in Barry Levinson’s “Man of the Year” (Universal Pictures). He also appeared as “the fake dean of a fake college” in Steve Pink’s “Accepted” (Universal Pictures) and as the harried airport manager in Paul Feig’s “Unaccompanied Minors” (Warner Bros.). He lent his voice to Jimmy in Bob Saget’s parody “Farce of the Penguins” (Thinkfilm). As a long time mentor with the 52nd Street Project, Black was roasted in Charred Black 2007, which drew the largest fundraising numbers in the Project’s history. He’s a member of their advisory board, is co-chair of their capital campaign, and in 2000, the Ron Black Memorial Scholarship Fund was created in memory of his late brother. Black is also committed to raising funds for the Rusty Magee Clinic for Families and Health. He’s a strong supporter of both the Cystic Fibrosis Foundation and Autism Speaks and was honored by The Brady Center for his commitment to ending gun violence. In 2012, he was honored by the ACLU of Georgia with their National Civil Liberties Award. At the Williamstown Theatre Festival, he established the William Foeller Fellowship, having taught and performed at the festival for more than a decade. Black also supports our military personnel and has performed in three tours with the USO, visiting several Middle Eastern and European military bases with Robin Williams, Lance Armstrong, Kid Rock, Miss America Rachel Smith and Kellie Pickler. Black resides in both Manhattan and Chapel Hill, N.C. Still loyal to his alma mater, he’s worked with UNC students to create the Carolina Comedy Festival, a yearly festival on the UNC campus that highlights performances and provides workshops and lectures for budding comics, writers and performers. With his involvement at UNC, Black continues a life-long commitment to education and the arts. He continues to tour heavily, playing countless dates each year and providing a cathartic release of anger and disillusionment for his audience. In his leisure time, Black likes to play golf, even though golf hates him.